I’ve been putting off writing my blog tonight, but if I want to watch Glee when it comes on, I can’t put it off any longer. Today is my mother’s birthday, and I want to write a tribute to her. The problem is that I have so much love in my heart and I’m so grateful for her that I don’t know where to begin. I guess I’ll start with the last two days. My mother spent yesterday and today, her birthday, cleaning my house from top to bottom, well actually bottom to top. She enlisted some help that I will have to pay, worth every penny by the way, but my mother did it just because she loves me. How many mothers do that for their adult children? She knows how busy we are with everything and saw how she could help, and did it. Tonight we celebrated how we usually do on Mom’s birthday. Dad cooked her a birthday dinner, I made cupcakes and took them over, and after supper Seldon and I decorated her tree for her. This was the first year I have had help. Savanna shows zero interest in most things domestic. While we were doing that Savanna downloaded ‘Skype’ for her Nanny so she could skype with Greg & Patti when the baby arrives. 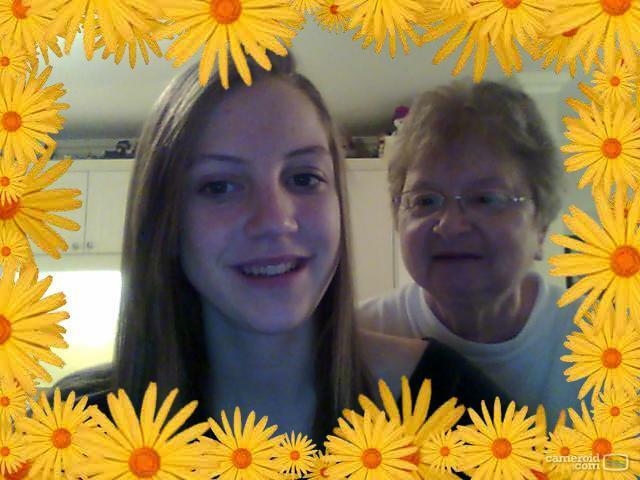 They took this photo on the webcam with Mom’s new laptop. The older my own children get, the more I understand and appreciate everything my mother has done for me! I couldn’t tell you everything because she has done so much. But, as an adult she has given me more than I could ever expect. Both of my parents have been gracious and giving, always! Last year mom was very sick. She spent most of her summer in the hospital and almost a whole month in a quarantined room. She’s getting stronger every week. I’m grateful that she spent the last couple of days cleaning my house, but more than that I’m grateful that she is well enough for me to even consider allowing her to do that. We were fearful we’d lose Mom last summer and I don’t take for granted a single day we have to live this life together now. In my 10th grade English class we’re reading To Kill a Mockingbird. Today we read about and discussed the Jim Crow laws that existed in the south as recently as the 1960’s to keep black and white people segregated. The laws were written to keep the races “separate but equal” but racial segregation was anything but ‘equal’. Sometimes I wonder if students ever wonder why we’re focusing on a classic historical fiction novel set in 1930’s Alabama. But, I suggest that it has more relevance to us than they realize. Have you ever heard of Africville? I hadn’t until a couple of years ago when Savanna did a school project on it. I challenged my students to google it. If you’ve never heard of it, click the link. If you’re from the East Coast, you’ll be shocked that this happened in our backyard. On Friday a colleague sent an email about this website saying it was a great place to listen to music. Usually I ignore these kinds of emails because I get so many emails in the run of one day; the ones that don’t seem important are just deleted. So, I glanced at it and didn’t give it a second thought until another teacher on my facebook said how much he was enjoying grooveshark.com. I was just wasting time on facebook anyway, so I decided to check it out and I’m SO GLAD I did! You can find almost any song you’d ever want to listen to here. You can create playlists, and you’re not downloading anything. The drawback? I can’t put this music on my Zune, but I rarely use my Zune anyway. For the last two nights in a row I’ve been up well past midnight playing with grooveshark. I’ve created six different playlists. Yesterday, while I was digging out my Christmas dishes and a few other Christmas items, I plugged the laptop into the stereo and played my Christmas playlist. Last night I spent a few hours creating an oldies playlist of songs from the late 70’s and early 80’s. I was listening with my headphones in and at one point Glenn asked with a bit of a mocking tone to his voice, “Are you dancing?” It was a sort of couch dance thing where my arms and head were moving but that was all. “Shut up!” was my reply. Whatever, he knows I love him. I’m glad I could be there for his personal amusement. I played my oldies playlist this morning while Glenn and I were working in the kitchen together. He asked me if playlists could be deleted once they were created. I said, “I think so.” I don’t think he liked my idea of good oldies. I think it was Copacabanna that did it. But, I don’t like that song so much anyway, I think I’ll delete it. I’ve had fun travelling back to the music of my childhood. I have several songs by ABBA and Olivia Newton John on my playlist. Some of the gems I found by other artists: Pilot of the Airwaves, Hot Child in the City, and Heard it in a Love Song. Glenn approved of that last one, but made it clear that my oldies playlist wouldn’t be great for a party. I guess that’ll be the next playlist I’ll create. I also need a playlist I could play at school without being openly ridiculed by fifteen year olds. If you love music, and would use your computer to listen but don’t want to download try grooveshark, but I must warn… it’s addictive! My husband and I have a Saturday morning ritual. We roll out of bed around 7 AM and pull on something comfortable and don hats to hide our bedhead. We make coffee to take with us, then go to the Boyce’s Farmers Market for local vegetables and meat. Sometimes for a treat we buy cheesecake, samosas, bundles, kettle corn, or nuts, just never all on the same day. Occasionally, after our trip to the market we’ll go for breakfast. The Cabin is our favourite place, but we sometimes go to The Sunshine Diner or Jack & Andy’s. Today we tried a new place. We went to a little basement cafe in the Charlotte Street Arts Centre called Sweet Belgian Desire. Their specialty is Belgian waffles. I’m not much for pancakes and waffles. I like them alright but if I have a choice I’d choose eggs and bacon 95% of the time. 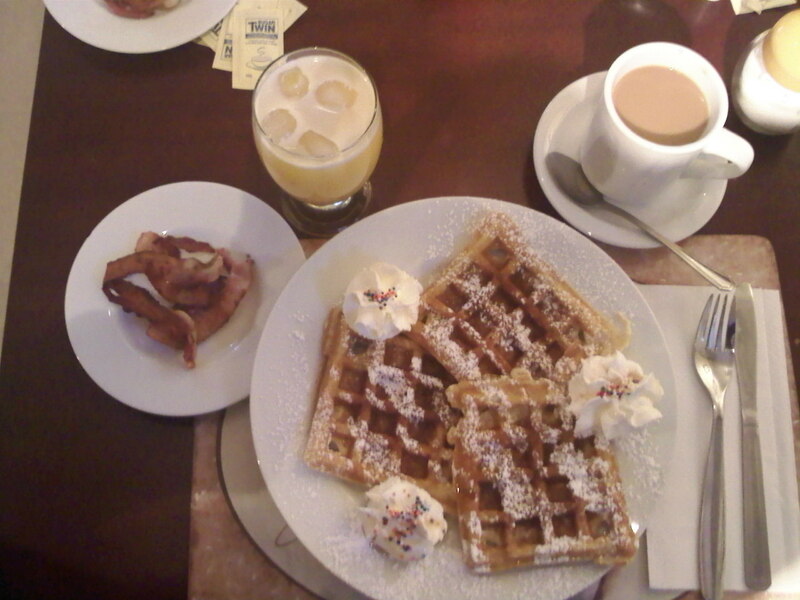 But, I couldn’t go to a place that specializes in Belgian waffles and order an omelet. So, when my breakfast came, I decided I’d use Glenn’s phone to take a photo. Blogging every day will cause you to take photos of things you’ve never even thought of photographing before. The waffles were delicious; but to be honest, the ones we make at home are better. I’ve decided that I’d still rather have bacon and eggs when I go out for breakfast simply because I make more of a mess in my kitchen when I cook them, than when I cook waffles or pancakes. So, I can cross #29 off my 40 Before 40 list, but I think I’ll wait. I’d like to try Racines or The Palate and the list gives me a great excuse to do so. I’ll go back to Sweet Belgian Desire occasionally. The atmosphere is great, and it’s interesting to walk through the Arts Centre and take in the artwork hanging in the building and walk by all the young parents with their three and four year olds taking ballet classes. I think I’d like to try it for lunch next time. They had an interesting lunch menu. But, the next time we go for Saturday morning breakfast out, I can guarantee it’ll be the tried and true Cabin Restaurant. In one of my masters courses I had to write about myself as a literate individual. This piece of writing ended up being very personal. It’s perhaps the piece I’m most proud of. I’m including large chunks of it here, but I won’t bore you with the whole paper. It’s kind of long, so if you don’t want to (or don’t have time to) read it all, just read the quote and first paragraph. I did a little dance after that first paragraph I was so happy with it. I cheer for books, and my own writing makes me dance sometimes; what can I say? and not one of them can save me. Like hearing the first line of a well-loved song from the glory days of my adolescence, or the smell of my mother’s apple crumble wafting through the house as it bakes, a book that captivates me from beginning to end read in a comfy spot in the summer sun takes me back to a place in my childhood that will forever be engraved in my heart and mind. Reading something I choose to read for no other reason except that I want to read it while relaxing outdoors is one of the greatest indulgences I allow myself. It reminds me of lying on the rusty old hammock that hung between the two huge maple trees behind my grandparents’ lakeside cottage, getting lost in a book. I have so little time for pleasure reading that when I get time to do it I feel like I’m giving myself a treat. I can relate so easily to Nye’s poem that was written as a tribute to well-known American poet William Stafford. She feels like she is constantly barraged with words, but the comforting words of a well-loved poet can keep us afloat during the pressures of life’s storms. The reading I do for pleasure is my most valued literate practice, it sustains my soul. I often read fiction to experience things that I would never otherwise be able to experience. With a good book I can become deaf, blind and mute and learn to be literate. I can be an orphan who teaches my new adoptive parents patience, love and laughter. I can be a serial killer who targets a specific demographic or the hot-shot detective that hunts him down. I can be a talking pig who takes over a farm. I can be a regular teenage girl who finds herself suddenly head over heals in love with a vampire. I can be a young star-crossed lover who commits suicide to eternally be with her lover, AND live to tell about it. When it comes to what others are reading, I’m nosey. I’ll interrupt complete strangers in an airport to ask what they’re reading. Or, if I see someone reading I book I loved, a conversation must happen. I’ve experienced that literacy is social. I love to share my love for literature. I share what I love reading with my family, friends, colleague, students and online acquaintances. It gives me pleasure to introduce someone else to an author they end up loving, or a book that they go on to introduce others to. Living out my literacy means wanting to make connections around text both in my classroom and in my lifeworld. Personally, connections are extremely important to me. I based many of my choices of text on the recommendations of other readers I trust. But, in order to grab, maintain and sustain my interest I must also connect to what I’m reading. The stronger the connections the easier it is for me to understand and enjoy what I’m reading. As I write this I’m reminded of the idea of Donald Murray’s that “writing is thinking”. I’m having an epiphany like reminder of the importance of connections for readers and writers alike. Personally, as a literate individual, I value reading and writing to which I make strong connections. It doesn’t mean my repertoire is limited to one or two genres or forms, but it means that I have a tendency to read and write to my own diverse and growing interests. I value literacy that challenges my beliefs and expands my thinking. I often search for text to answer a question or help me solve a problem. As I’ve matured I’ve learned to value the reading I do for educational purposes, but this was not an innate practice. Even in this kind of reading, I must make connections. I must be permitted, no, I must be encouraged to highlight and write in the margins. I need to be able to “talk” back to the author as I read. I like to take what published authors have to say and use that to reframe my own ideas about similar topics. Although I love to write, I read much more than I write. I’ve recently started to blog. Since childhood I’ve had a romantic notion of keeping a diary or journal. Maybe I thought something interesting would happen to me and my diaries would be published after my untimely death. But, journaling was something I just couldn’t seem to stick with. Since then, I’ve learned that the monotonies of my day are usually not worth writing about, and certainly would never be worth publishing. But, I’ve recently started to blog. I’ve learned to use those same monotonies to express myself through humor and to grab onto a small part of a conversation or something I noted or read and use it as a jumping off point to get my creativity flowing. Now, I blog about personal goals, people I love, memories both funny and precious, the humor I find in life and I share my own creativity through art and poetry. Just as with my reading, the writing I do because I want to and because I use it as a form of self-expression is one of my most valued literate practices. Technology has had a huge impact on me as a writer and is also beginning to impact the way I read. I write for various purposes, but most of it is not without the aid of technology. I write to communicate usually by email; I write to model for my students, through the use of technology; I blog, which allows me to self-publish through the aid of technology. All of my professional and educational writing is generated and kept digitally. Technology allows and encourages me to write more than I would ever write with pen and paper. It makes writing more enjoyable and seems less like tedious work. Yet, due to its limited availability at school, my students rarely use technology to produce their own writing for school. As a reader, technology is creeping in and I cannot ignore its impact. Because I blog, I’m beginning to take an interest in the blogs of others. I link the blogs I read to the blog I’m writing. Every Thursday Savanna has an enrichment program, and it’s held in a church hall on Church Street downtown. I go pick her and a few others up on my prep and drive them back to school. Today I had some errands to run, so I dropped them off at school and went to run my errands. As I was driving back to school and listening to the radio, I heard an old song that I absolutely LOVE! Every time I hear it I want to sing and dance. But, to be brutally honest I couldn’t carry a tune even if it had comfy handles. Taking into consideration my musical handicap, I rarely let others hear me sing. This is difficult because I do love to sing, and I think that’s why God spared me the talent to do so. I’d likely be ridiculed for breaking out into random song on a regular basis if I thought that my singing wasn’t offensive. So, when I find myself alone in my car, with the radio playing an awesome ‘sing-along’ song, I can’t help myself. I don’t care what drivers in oncoming cars think when they see me obviously singing with wild abandon slapping the steering wheel like it was my own personal drum. They don’t know me, nor will likely ever remember if they see me again. I have 2238 emails sitting in my work email account at this moment. That doesn’t count the thirty or so I just deleted in the last half hour. Someone, somewhere in the province mistakenly sent out an email to every teacher in the province. It had nothing to do with me, she recalled it minutes later, but it was too late. Now teachers from all over the province are responding, saying it has nothing to do with them, please take them out of the distribution list (which is impossible), and even teachers tell other to stop replying all. With each new email… beep beep, there’s another one, I find myself becoming more and more aggravated. How can professionals not realize what is happening, instead they’re adding to the madness. That little rant was a diversion from my real topic. Yes, I have 2238 emails, well actually 2240 because in the time it took me to write the (2241) above paragraph the stupid “this was not meant for me” emails keep pouring in. I had over 2600 emails last week but I took a whole hour to go through and delete one I didn’t need or transfer the ones I wanted to keep to a different folder. At that rate it’ll take me a whole day to go through my emails to whittle them down to a reasonable and manageable quantity. And, let’s face it, if you know me at all, you’d know I’d just be in the same situation in a few months. I’m usually very careful when deleting email. I’m choosey because I’m worried that after I delete an email pertaining to me, I might need it again for future reference. So, I’m reluctant to delete it. I leave my work email sitting on the server because if I downloaded it to outlook I’d never delete any of it. Usually I get an automated message from the server telling me I have to delete because my inbox is reaching its limit and soon I won’t be able to receive any more emails. That is what usually kicks me into delete mode. Well, I haven’t received one of those emails in a very long time. The powers that be in ‘serverland’ must have granted me extra space. I want a fresh start! It would be a blessing if somehow all of my emails got mistakenly deleted. So, please cheer me on, and join me if you dare, because I’m declaring email bankruptcy! I’m going to keep the email from November and sort through those and I’m deleting EVERYTHING else. I figure if I delete something important I’ll have to get the information some other way. This goes for my sent folder too, which is almost as bad. Okay, ready, set, there they go! How freeing!